Chilcoten Raspberry is a vigorous plant that bears fruit in midsummer and bears a second crop in fall. It produces medium red, firm fruit that are sweet. The canes are upright and prickly. Dark green leaves turn yellow with tinges of red and orange in the fall. It will grow to a height of 5' to 6' tall and just as wide. 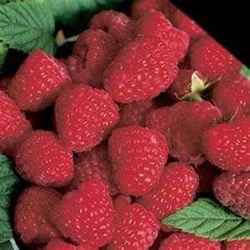 Keep the raspberries watered well during fruit ripening stage to ensure large berries. Butterflies and bees are attracted to the flowers. Raspberries are rich source of vitamin C and they are high in manganese. They are also very high in dietary fiber. Raspberries are self pollinating. Chilcoten Raspberry likes to be planted in full sun or partial sun.